With the recent resurgence of hype around podcasting, you may be wondering how best to record your own. There are plenty of apps out there to handle the task, but a new one called Opinion tackles it in a fun, simple and original way. Available today for iOS, Opinion takes the unusual approach of showing the waveform of your recording vertically down the screen, as opposed the conventional horizontal view. This makes it feel a bit more ‘mobile native’ and makes it easy to assemble an entire podcast on the go, as you only need one hand to hold your device. Tap the ‘record’ button and your audio is saved in a chunk that you can then trim with a simple scissor tool. Re-ordering sections of the podcast is as simple as dragging them with your finger. Once you’re done, you can share your audio straight to SoundCloud or via email, Airdrop or iMessage. 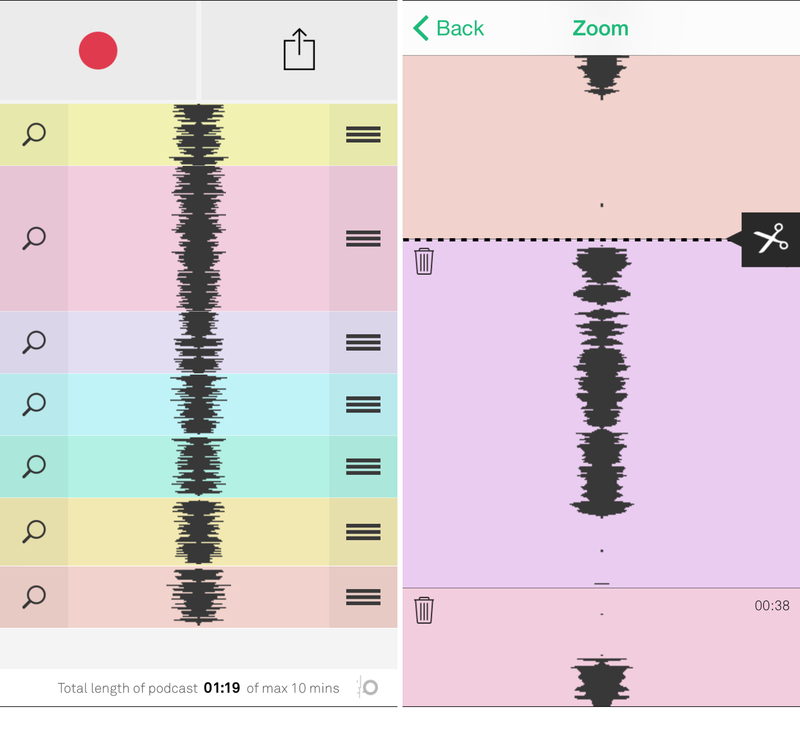 This app lacks bells and whistles that some may find essential for their podcasts – you can’t import music or mix multiple layers of audio together, for example. You can’t manage multiple projects at one time, either. This really is all about simplicity and accessibility. Opinion is the work of Tor Rauden Källstigen, whose previous startup, Loopcam, offered an app that allowed you to create and share animated GIFs. Loopcam is still around, but the team decided to split up to focus on other opportunities. CEO Källstigen and one of the developers started a new company called Aodio to launch this new app. Opinion is a free download and allows you to create podcasts of up to 10 minutes in length. An in-app purchase costing $3.99 unlocks unlimited recording.